One of the eternally fascinating things about telecoms is how comparatively small changes – down to shifts in quantum states in the underlying silicon – can have huge and greatly amplified effects out in the everyday real world. Nowhere is this more true than in the M2M/IoT environment. Click to download the pdf and read the full interview! 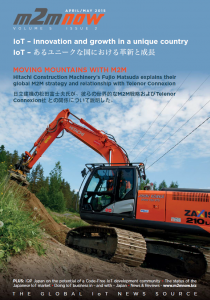 For one company in particular – Hitachi Construction Machinery (HCM) – the application of an M2M strategy over the last few years has, quite literally, allowed them and their customers to move mountains. As one of the world’s leading manufacturers of the heavy plant and machinery used in construction, mining, forestry and other heavy engineering industries, HCM has long been recognised as a major innovator in the use of M2M in its sector. Currently operating globally, HCM relies on Telenor Connexion – the specialist M2M/ IoT arm of international telecoms service provider Telenor – to provide essential connectivity and consulting services. Working closely together, they’re able to keep HCM’s plant and machinery operating more efficiently, cost-effectively and securely than its competitors, while simultaneously creating added value for the company and its customers through the development of new business models, services and machines. One key aspect of this involves being able to pull in data from the field to drive continuous product improvement and enhance customer relationships and loyalty even further. 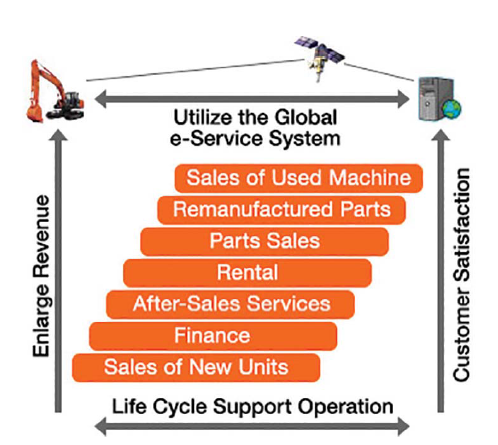 Our customers want to extract the maximum working value from their machines throughout their lifetime. M2M Now’s Alun Lewis recently spoke with Fujio Matsuda, general manager at HCM’s Global Business System Centre and IT PromotionDivision, about how his company’s M2M strategy has grown over the years to become central to HCM’s growth and success. M2M Now: Mr Matsuda, could you talk us through how HCM firstly identified M2M as an important area for the company? Fujio Matsuda: We clearly saw back in the 1990s how important M2M could be to us as a business. Our machines are high-value, complex pieces of equipment, often operating in frontier or environmentally harsh conditions. Our customers want to extract the maximum working value from their machines throughout their lifetime while, simultaneously, we want to keep their machinery operating at peak efficiency – and that means having the best maintenance and repair systems possible in place, irrespective of where that plant is operating, which could be anywhere on the planet. In this setting, it was very clear to us early on that M2M could have a critical role to play in supporting many aspects of our operations. With data coming back to us from a variety of sensors within the machines, measuring such things as oil pressure and temperatures, as well as surrounding environmental conditions such as dangerous heat, we’d be able to optimise our maintenance operations to keep our plant working harder and better for even longer. Preventive maintenance jobs can be planned more effectively, ensuring that the right staff with the right skills, tools and components will be in the right part of the world at the right time. Once you’ve got that data coming in, you’re also able to quickly spot any emerging problems with product designs and eliminate any component weaknesses in the original design or supply chain. Additionally, the ability to track and locate our plant would prove to be invaluable in deterring theft, while also supporting the second-user market for our machinery by making full service and ownership histories to new buyers. M2M Now: It’s fast becoming clear that huge commercial value can now start to be extracted from the thousands of connected devices proliferating around the world. How is HCM exploiting this new asset and what’s going to be your future direction in this area? Fujio Matsuda: At the most basic level, there are essentially two types of data that we receive from the M2M modules and machinery. On one hand, we use data logging principles to collect information on components, usage, and the whole operating environment and this is regularly communicated back via Telenor Connexion and then to our own management systems. On top of this, we’re also able to collect alarm information when particular conditions – such as a component overheating or oil pressures falling dangerously low – and alert the operator and our local distributors accordingly to prevent serious damage and get repair teams on the road as quickly as possible. The data we collect has an almost infinite multiplicity of possible uses – but all are ultimately focused on helping HCM make better, more reliable and more cost-effective products. We can quickly learn lessons about typical usage profiles amongst our many different types of customers and develop commercial relationships that suit their needs more elegantly andefficiently, helping them achieve their own business ambitions. Alternatively, information is fed back into our own design and manufacturing processes to make our products an even better fit for the different worlds that they’re going to end up operating in. In terms of future plans, we’re also starting to look at the possible benefits of collecting some data in real time to develop a more dynamic and flexible response for our customers. We’re sharing information about machine performance with major customers and our all-important dealer network who often provide the front line support for customers out in the field. In more remote areas, the logistics and costs involved in getting maintenance teams to sites can be large and when an engineer arrives it’s vital that they have the tools, parts and skills already with them to resolve the precise problem. This sharing of information is beneficial to everyone, helping to prioritise decision making where maintenance scheduling is concerned and, once again, strengthening the bonds between HCM, our dealers and our end customers. One final aspect enhances that support even further by helping owners and operators protect their own investments in our products. With the theft of heavy plant being a major issue these days, with equipment often being stolen for export to customers in developing countries, not only are we able to track the movement of assets through GPS technology, but we can also ‘kill’ equipment remotely, rendering it useless until the intervention of an HCM-approved engineer. You can find more information regarding Telenor Connexion´s IoT offerings here.